I've been waiting for a couple of things to arrive in the mail this week. Not patiently waiting. Waiting while getting crankier and crankier. Yesterday, a miracle occurred because packages arrived. Just not everything I was expecting. However, it was all happy mail. Norma had a contest on her blog last week, and I won a prize. Who knew the random number generator would pick* #1? I mean really! Think that's enough links for one short paragraph? Please keep in mind it's so dark and stormy here that the cat ate breakfast and went back to bed. Not that I blame her. Once I'm done typing this, I'm joining her. Too yucky outside to be outside the covers. 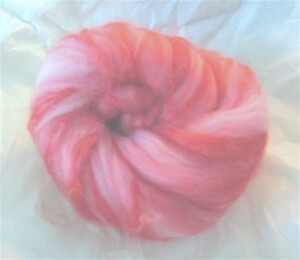 I'm not sure what the roving is beyond it's pink and lovely. I'm guessing it's a blend, but we'll have to see if Norma tells us. Now if the yarn I need would just get here, I could get started on the project knitting. Oh, and currently I'm working on a pair of boring ribbed socks in freezer (stash) yarn. I like the yarn and this time of year, I'm loving that drawer of hand knit socks. I've blocked out knitting most of them, but I do love them. *I typed "pink" and had to fix it. Think that means something? Shut up! Now you just have to start spinning ... and not in circles like your cat! Beautiful roving! Do you spin? Oh, dear. I thought I said. Silly me -- why would I, I suppose? I even forgot I sent it to you. Hee. Anyhoo, it's (some kind of nice) wool and Tussah silk, hand blended by the lovely Kae of Faerielady Knits. Verra verra nice. Take that wool to bed with you. It'll keep you extra warm. I hope ya'll stay dry up there. I think that is lovely roving from Norma. Makes me think of mid-February. I hope you and the cat are staying warm and cozy. me wants to eats it. Ohh pretty roving. Hope you are having a relaxing day. Norma wasn't kidding, it sure is pink here! Listen, the cats pay the vets (I don't know how) to make us believe that they could be going at any time. It's a feline subversive underground thing and the vets will never tell. LOL: roving in a rainstorm! You made a pink heart! You are my hero. For more reasons than that, of course! Love, love LOVE the pink. Kae does wonderful work. I think Dave bought some from me when I did my mini de-stash. Or maybe it was Jen. I don't know. But I still have some left to spin. Ok... so you don't like knitting... I see a spinning obsession coming on. I mean REALLY! You're stocking up for the end of the world over there.